The old curtain in all its glory. Photos Courtesy of Paducah Art House Alliance. Inside the theatre showing the deterioration. Photos Courtesy of Paducah Art House Alliance. The vestibule. Photos Courtesy of Paducah Art House Alliance. While these theaters usually had gaudy exteriors, it was inside where they showed their pomp, with carpeted stairs, marble-lined hallways, crystal chandeliers and uniformed ushers to show patrons to their seats. In 1927, the Columbia Theatre opened in Paducah, featuring the movie “It” starring Clara Bow. This majestic theater was modeled after the grand Rialto Theater in Louisville, and presented both vaudeville acts and movies. Decade after decade this theater served as a jewel of the Paducah community. But high maintenance costs and intense competition from television that cut into its audience spelled the end of its enduring run. It closed in 1987, as did other theaters in other towns and cities. Many of the grand theaters around the country were torn down. 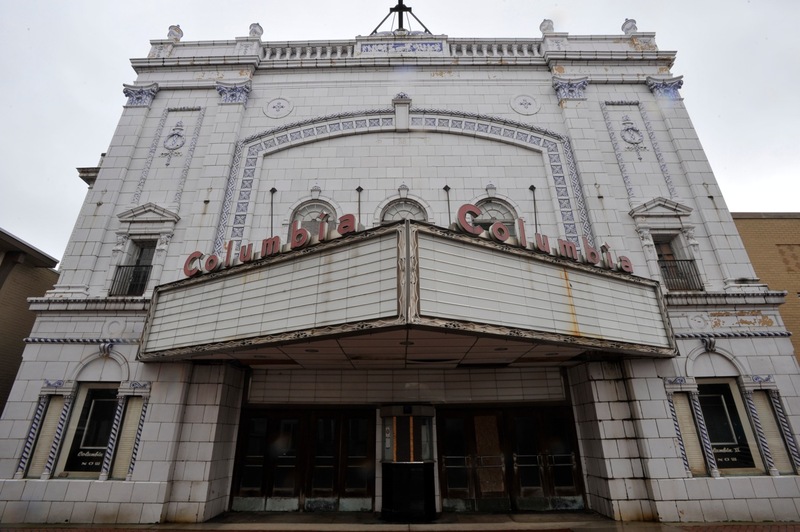 But the Columbia Theatre didn’t suffer the same fate – in large part because it had been built – as many buildings were at that time – with an abundance of fire-resistant asbestos. It was found in the pipe insulation, joint compounds, linoleum and window putty. It was woven into the beautiful curtain displaying the Statue of Liberty standing proudly in New York harbor. The curtain’s purpose was to protect the audience from the threat of fire. At the time the curtain was created in the 1920s, manufacturers were unaware of the dangers associated with asbestos. But its presence in the building made the site a brownfield – a property that is or is perceived to be contaminated. Since asbestos made the building too contaminated for use and would have had to be removed at great cost before the building could even be razed, the current owner donated the theater to the city of Paducah in December 2003. The owner hoped the city could facilitate the transfer of this once-beautiful building to a for-profit business that would undertake its restoration. Before any asbestos removal or restoration could take place to make the structure safe to use, an assessment was done to determine what steps needed to be taken to remediate the property. The Kentucky Brownfield Redevelopment Program, a part of the Division for Compliance Assistance, was contacted to do an assessment and for assistance in obtaining funding for the cleanup. A highly respected restoration artist and two assistants coordinated the painstaking work of patching large holes that had been cut into the curtain and preparing it for the repainting and restoration of the classic harbor scene. “They scraped away the layers and determined the original paint scheme and subsequent paint applications in order to create a palette that will be used for the ultimate restoration of the theater,” Mazzone said. Today, the Americana curtain has been restored to its original splendor. The building also features an elaborate façade of blue and white terra cotta tiles and an eclectic assortment of architectural details, including spiraled Byzantine columns, classical urns, friezes, and busts of Greek goddesses. The two architectural styles in the building are Adamesque and Skouras. Architectural consultants are unaware of any other American theater exhibiting both of these styles in one building, which makes it unsurpassed in the U.S.
A panel from the original stained glass ceiling inside the theater was also recovered and cleaned, revealing the coloration of the glass work, giving the restoration team further insight about early interior color palettes. There’s much enthusiasm for the project in the community and surrounding region. Little wonder. In its heyday, the theater drew from a wide geographic area in western Kentucky. Back in 1930, when the country’s population was 122 million, and the Great Depression was just beginning, with Americans going to the movies 95 million times a week. Those fortunate enough to have visited the theatre then and seen its opulence have vivid memories of it, and its restaurants, nurseries for children, art galleries, dance floors and free telephone calls that were all amenities offered in some of the larger theaters. In addition to the $49,000 remediation grant from the Kentucky Brownfield Redevelopment Program, other grants were awarded for the building’s restoration: $50,000 from the Carson Myre Foundation in Paducah, $25,000 from the Community Foundation of Western Kentucky and $17,000 from the Kentucky Colonels to be used on the restoring the curtain. A capital campaign will be initiated to raise the funds for the complete restoration of the building. After the restoration is complete, the theater will reopen as a cinematic art house focusing on foreign and independent films – to be supplemented with live entertainment, such as music, comedy and stage productions. There will be three theaters in the building, the main ground floor theater and two on the second floor. It will also be available for private rentals that will have the option to rent part or all of the building.